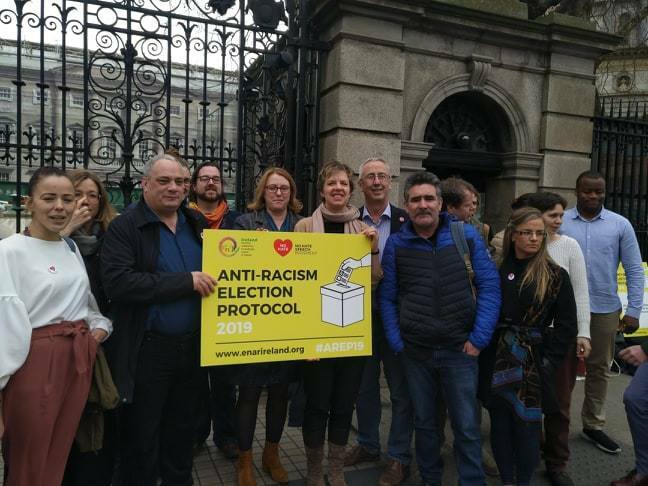 Pavee Point Traveller & Roma Centre welcomes that all main political parties signed up to the Anti-Racism Electoral Protocol launched today by the European Network Against Racism on International Day For the Elimination of Racial Discrimination. “Recent elections have resulted in a rise in racist discourse. We also see a rise in racist violence, harassment and abuse and online hate speech,” he said. “Political parties need to make sure their candidates are aware of this protocol and independent candidates also need to sign up,” said Gabi Muntean of Pavee Point’s Roma Programme at the launch. In signing up to this protocol, politicians promise to conduct debate in a responsible way that does not target marginalised and vulnerable groups. Politicians also promise to use election materials that reflect the diversity of our society. The protocol was first introduced as part of Ireland’s National Plan Against Racism 2004-2008 and has been re-established by ENAR which is a network of anti-racism civil society organisations. Martin Collins called for the establishment of a new National Action Plan Against Racism to actively challenge racism and promote diversity. Other speakers also called for the Government to act on racism and to introduce hate crime and stronger hate speech legislation. The Irish Government will be examined this year in Geneva on the UN Convention on the Elimination of Racial Discrimination which it ratified in 2000.